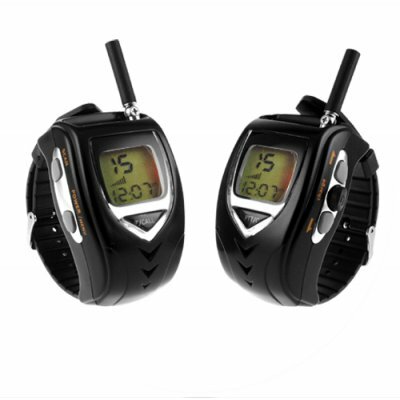 Successfully Added Walkie Talkie Watch Set - Edition - USA to your Shopping Cart. Walkie Talkie Watch Set - Edition - USA. Pair of stylish, matte black walkie talkies (also called 2-way radios) specially designed to fit on a wrist strap for a high-tech way of keeping in contact. Featuring multiple channel support, a backlit digital LCD screen, 3+ km operational range, and a rechargeable Li-ion battery, this is an extremely well-rounded and powerful communication device to own. This fully-featured communication device makes a great in-field way to keep track of workers or family members during hiking trips, amusement park adventures, holiday shopping mall trips, or other outdoor activities where people may be separated for hours at a time. A very good communication choice for anyone looking to keep in contact in circumstances where cell phones may not make sense. This model is designed for use within North America and South America or anyplace else that uses open radio frequencies similar to the US standards. In stock in our warehouse right now, so click "add to cart" and we will express ship out your order tomorrow.